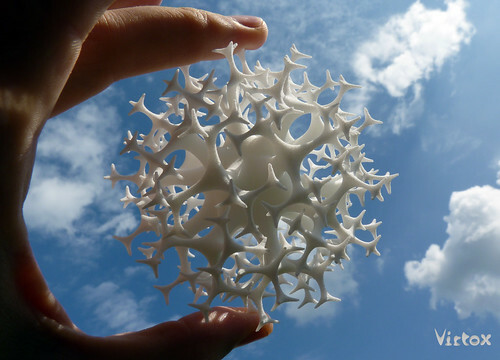 3D design by Virtox, Dutch 3D printer designer, featured on Thingiverse. There’s no shortage of press and media attention focused on 3D printing, ranging from manufacturing metal guns to restoration of human facial parts or jet engine parts to Victoria’s Secret angel wings. Beyond the press coverage, there is a significant, unanswered question that needs to be answered: What does this mean for traditional corporate business models? I’ve taken classes at TechShop on 3D printing, visited the Shapeways factory, and own a few 3D printed goods (with more coming). I’m stunned by the many materials that can be printed, including steel, gold, chocolate, wood, proteins, and a variety of plastics. The folks at Stratasys recently left comments on a prior post, which prompted me to look into the many industry specific applications their 3D printer services provide. This trend is only going to increase, as indicated recently by HP’s Meg Whitman’s public pronouncements about their entry into this space in 2014. Also MakerBot, a popular 3D printer, has pledged to supply 3D printers to teachers, who, in turn, will teach our next generation of students. Google Trends, which tracks searches for a term, shows a steep increase of the number of people seeking to learn more about this new technology, a strong indicator of growing interest. But what does it mean? The relationship between the people formerly known as consumers will continue to change. Former consumers are now designers, producers, and manufactures. Or, if regular people aren’t actually using these tools, they can tap the marketplace of designers, like 3D files in Thingiverse, or use 3D printing as a service with companies like Shapeways, Ponoko, Kraftwurx or print at their local TechShop. 1) New skillsets required 3D design professionals will develop new skills, including replicating, modeling, and configuring the printers themselves. Students are learning these skills. Expect these to be common on resumes in a few short years. 3) Rise in local production shifts supply chain Local production is going to cause rifts in traditional supply chain management and global logistics as products are produced on site, or near a neighborhood. If items are produced on site, dependency on low skilled foreign labor and global shipping are impacted. 4) On-demand printing reduces waste and impacts inventory On-demand printing will effectively reduce the need for large inventories, reducing many costs from warehousing to inventory taxes. A reduction in warehouses filled with idle goods. Retail stores shift to experiences over showcasing. 5) Customization of goods challenges the tenets of industrial revolution Personalization of goods will disrupt mass standardization. This means that body features, measurements, and preferences are saved online in a new profile. Having multiple sizes at a store to try on will give way to items that are designed for your body or need. 6) Complex and unique goods created for first time Unique and complex goods that never existed before will be printed, including intricate structures, like this statue. Some 3D designs are emulating organic materials –changing design and engineering trends. Solutions: There are five roles companies can choose to play in this powerful movement. Companies that make goods, ship goods, store goods, or sell goods are in for change. Supportive industries in design, customization, materials, logistics, and marketing are also going to be impacted by this growing technology. Rather than fight this new technology, companies must determine which of the five roles their company can play in this seminal post, ranging from: Financial Backer, Manufacturer, Supplier, Marketplace, Service Provider, and develop a strategy to implement this trend – rather than fight it or ignore it.